You don’t have to take my word for it. Good book reviews should probably be dispassionate, objective, critical. But when a book not only grabs your intellect but keeps you up into the wee hours to see how it’s going to end, you have to lay your cards on the table and be honest about your enthusiasm. In short, I loved The Heart of Light: A Tale of Solmon Star by Charlie W. Starr. Let me tell you why. The market is full of dystopian literature these days. Either it’s a young girl hailing from District 12 or another “diverging” from the masses. These types of books, although entertaining, can also be informative. They teach us to truly embrace individualism, to be critical thinkers, to avoid blithely surrendering our allegiance to a “benevolent” administration. Our heroes are not always mingling with the echelon. Sometimes they crouch among the followers and quietly provide obedience. Literary enthusiasts and scholars call it the climax. That sacred hour in which our beloved character has to make a choice. It is not an ordinary decision, rather one that will make or break his/her preconceived notions of the world. A life-altering shift that some avoid out of fear, others out of convenience or retribution. Solomon Star is that character. He is commanded to find his father on a distant jungle planet, Kall. Problems with the natives there have made the economy grind to a halt. Solomon is a Colonel in the army but was once, and far more importantly, an Imperial Guard, even the Captain of the Empress’s personal body guard. But of that time he bears only red-stained, white boots and a plasma sword, a frightful weapon which can only be operated by those who are genetically capable. Solomon is guided by a native of Kall simply named Savage. Meanwhile, on the galaxy’s capital world, the Empress Janis rules through a precarious balance of war and peace. She is lovely, an element which drew Solomon to her in the past. But something has passed between them, and Janis, Empress, goddess to millions, is a vengeful one. As military action and political intrigue make war seem inevitable, Solomon and the Savage navigate terrain both beautiful and treacherous, but none so dangerous as the machinations of Janis’s elite Intelligence arm, led by a mysterious scientist known only as the “Chief.” On one world, Janis journeys toward self-possessing darkness. On another, Solomon journeys toward the heart of light. Night fell arduous hours later for Solomon Star. He and his guide rested between two large tree roots in a niche of obvious human hewing. A fire burned in a specially cut groove. The blackened area around it betrayed the tree’s long time use as a Kalli resting place. Solomon rubbed a soothing ointment over the brush cuts on his face while noting that the indestructible single-suit he wore was already filled with tiny tears—the beginning of its conversion to rags. Night had fallen but had not engulfed the jungle. The strange luminescence that Solomon fancied he had seen the previous night asserted the certainty of its existence in the heart of the jungle. He thought perhaps some phosphorescent micro-organism might produce the glow but then decided he was wrong. The medicine on his face relaxed him. Blood pulsed in his cheeks and forehead. There was a life to the light, almost of itself. But nowhere could one point and say, “There is the source” (except the little stars, the fireflies—floating points of light). The intensity of the life that encompassed him seemed to generate the glow. It was light you couldn’t quite use to see with. Nothing was clear, but images danced before the vision, and Solomon experienced memories of a garden place he’d never seen. He felt fragmented images of orchards and flower beds, bushes in rows by height and color, rivers flowing east and west and north and south, meandering with a gurgle, rushing with a roar. Animals great and small roamed freely without fear of man, without inspiring it in men; he knew their names without voice. The greenness of the center place in the vision called him back to the Kalli Jungle. There was peace in the life—harmony. Starr’s writing, in many ways, resembles that of C.S. Lewis in his beloved space trilogy (Out of the Silent Planet, Perelandra, and That Hideous Strength). The descriptions are rich and vivid, as are the characters. This is no run-of-the-mill, predictable science fiction tale. This is story with true depth, saturated with a spiritual significance. 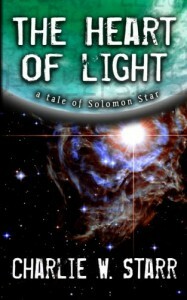 Solomon Star is a hero for the scientific age – trustworthy, agile, perceptive. He is a soldier, yet a warrior unblemished by his often difficult duties. I urge you to pick up a copy of The Heart of Light today! Click here to purchase from Amazon.